The retail investor’s sentiment flipped after two weeks to one where bears (45.45%) now outnumber the bulls (30.68%). The bearish sentiment, while high, isn’t at extremes. So a mildly bullish case can be made through contrarian analysis. The bulls and bears continued their stalemate as measured by this sentiment indicator. Both camps are 39.3% with 21.4% on the sidelines. Unfortunately, this doesn’t offer us any edge. And it hasn’t for the whole month of August with both bears and bulls being consistently equal to one another. The put/call ratio is middle of the range, closing on Friday at 0.68 (equity only). Nothing from this indicator in the past week, or even this whole month, provides any real insight. Lukewarm sentiment served with a side of bland. This indicator is similar to the CBOE put call ratio, but it only includes retail option trades (stripping out market making and institutional activity) and it also upends the ratio, placing puts in the denominator. On Thursday, August 28th 2008 it hit an extreme level of 162 - almost twice what it was at the beginning of the month. But the level wasn’t just noteworthy because of it’s numerical height. Thursday’s ratio was also noteworthy because it broke above the two standard deviation (from it’s 6 month average) barrier. This is usually a negative development because it means that the average option trader is much more interested in buying calls than puts. The market has not responded well these extreme ISEE Sentiment readings. They have resulted in mild losses going forward. While the market has gone sideways for the past two months, the sentiment of stock market newsletter writers, as measured by the Hulbert Stock Newsletter Sentiment Index has actually improved! Consider this: the S&P 500 closed on July 1st 2008 at 1284.91 and at the beginning of this past week at 1266.84 - almost the same level. But while two months ago the newsletters were suggesting an average exposure of -42.9% (that is to sell short the market), recently that exposure recommendation is -1.3%. The problem with the market is that while we have seen capitulation extremes, in March and in July, everyone is too eager to believe that the worst is over. Major market bottoms need more than extremes readings in indicators and panicked selling. They require that the majority of the market participants continue to avoid the market and disbelieve in the ensuing recovery. The ISEE ratio is a Call to Put ratio, opposite the CBOE’s Put/Call, according to their description when I subscribed to their updates. 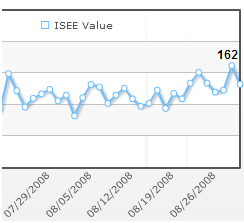 So an ISEE ratio of 162 should show more call buying than put buying, right? And reflects some pickup in bullish sentiment as I see it. Please clarify. And nice to get your updates. Enjoy your blog. yes Warren, you got it right. ISEE is call/put where a large number shows the average trader is buying more calls than puts. My apologies for the confusion, in this up is down world of contrarian analysis combined with the reversal from the CBOE ratio things got mixed up! So what’s your conclusion off the current observations? In terms of “most-likely” scenario that is, for the immediate future. if it isn’t clear, let me put it in different words: nothing compelling right now for the bulls and we’ve gotten here because people have been too excited to believe that previous spike lows have been “the” bottom. Read the last two paragraphs above. what do you think? I’d like to hear your thoughts as well. Was hoping to see if you had any directional bias for the immediate future. I have very similar conclusions, getting a bit antsy with all the lukewarm indications.